The Chairman of Parliament, Lembit Öpik and the Chair of Parliament’s Citizenship Committee, Ben Dell visited the beautiful coastal city of Cape Town in South Africa’s Western Cape to raise awareness of our nation and conduct verification of MP Elect Charles Metet. The warm reception received by the business leaders of South Africa was a welcome step for the first Space Nation which is working hard to get international recognition by other nations and international businesses. “I think if you count everything that has happened and the good will that was generated, this was one of the best events held for Asgardia and I’m proud to have been a small part.”, Ben Dell said. One of the key reasons for Lembit Opik’s arrival in South Africa was to carry out the verification of MP Elect Charles Metet who took the journey to Cape Town to meet his fellow Parliamentarians and take part in Asgardia’s outreach in South Africa. 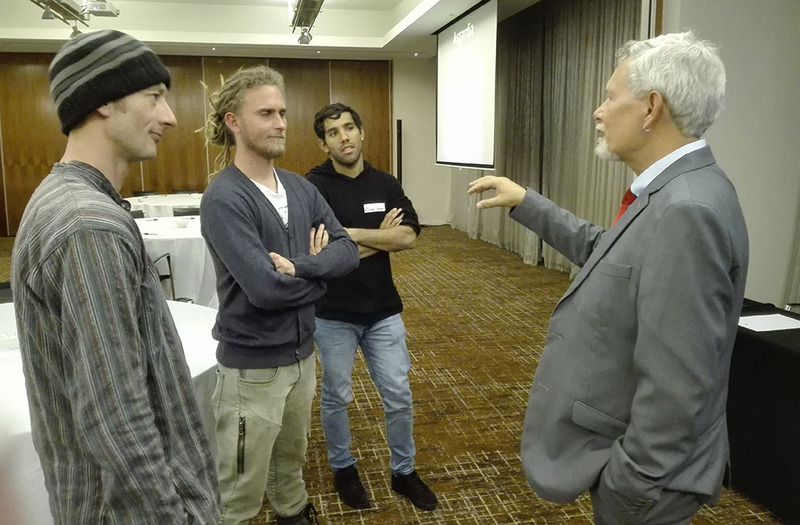 On the 14th of September, following the Verification of Charles Metet, the members of Asgardia’s Parliament attended the University of Cape Town for an event, arranged by Citizenship Chair Ben Dell, that was attended by over 25 PhD students. Students were introduced to Asgardia, the Nations core concepts and were given a chance to ask questions to get to know more. “Some intelligent questions were being asked – the same questions that we are currently asking ourselves.” Ben said. The interest from the students will be a keen point for Asgardia which has some lofty plans over the next 25 years to launch a network of satellites and solve some of the biggest problems facing humans living in space. Asgardia is creating financial mechanisms that will help to enable the next generation of innovators and space scientists through its initiatives such as start-up funding, an open approach to space science and satellites that will be equipped with a range of scientific tools. Following on from the UTC event, key Asgardian members of Parliament spent time with prime-time South African TV program Carte Blanche who had set out to make a short documentary on Asgardia and what we have in common with Cape Town. An undoubtable valuable activity that is set to help share Asgardia with a wide audience in South Africa. “The host was clearly very intelligent and pro science, I think it’s going to be great.” Ben commented on the outcome. Citizenship Chair Ben Dell who organised and hosted the event said, “The Asgardian meeting event was completely above my expectations.” as people from all walks of life, all social and financial backgrounds came together with a single dedication towards the vision of Asgardia. While the event wasn’t without its sceptics, speaking openly with Asgardia’s Parliament certainly helped to change some people’s minds explains Dell, “A sceptic emailed me the next day and told me how much he enjoyed the event and has decided to become an Asgardian. In this open session, over 40 Asgardians attended the event over the duration of the meeting, among them was Asgardian Abijit Nath who has started a project for self-contained and sustaining units that could potentially have applications in space who states that Asgardia helped to inspire the project. With Mayors soon taking up their positions in cities around the world, these sorts of events and meetings will become more commonplace and help increase the sense of Asgardia’s tangibility.